Walk (in the Rain) for Rice! Great turnout today at the Walk for Rice from the Seattle Betsuin Buddhist Women’s Association, Camp Fire, and general temple membership. 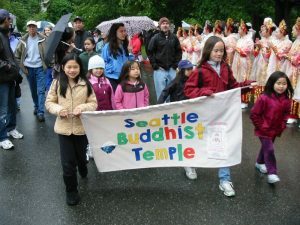 It was wet but we all wore smiles along with our raincoats walking the 2.5-mile loop around Seward Park. We walked behind a colorful church banner painted by Susie Taketa and adorned with a rice bag and tactile representation of a rice bowl. Church teams raised about $2000 for the ACRS food bank!